Pitti Uomo 2018, arrived at its 93° edition, was very rich in innovation and surprising collections. The street style looks dominated the catwalks and surely didn’t pass unnoticed. The runway shows of 2018/19 Winter collections have often been mistaken for costume parties. Men’s suits for formal occasions, for example, seemed to be inspired by the protagonists of historical films, thus remaining related to the main theme of the edition, that is cinema. We could find clothes that seemed to be taken from the set of Gangs of New York by Martin Scorsese, reproducing the style of the new American rich in the XIX century with their colored, checkered suits. There were also the outfits of The Untouchables, both the bad guys with panama hats and beige overcoats like Al Capone and the good guys wearing waistcoats and peaked caps. 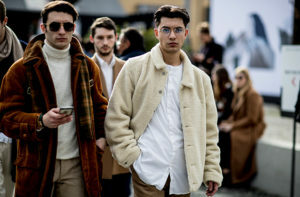 But at Pitti Uomo there was also room for outfits coming directly from the Far West, with cowboy hats, coats, vests and the unfailing pocket watches. However, inspirations didn’t came only from America, but also from Europe, with the British style that this year, too, has won the audience of Pitti Uomo. Scottish history was one of the protagonists, together with Italian history, characterized by the use of classic looks mixed – at the same time – with original fabrics and materials. This to give the impression of clothes taken directly from a costume movie.